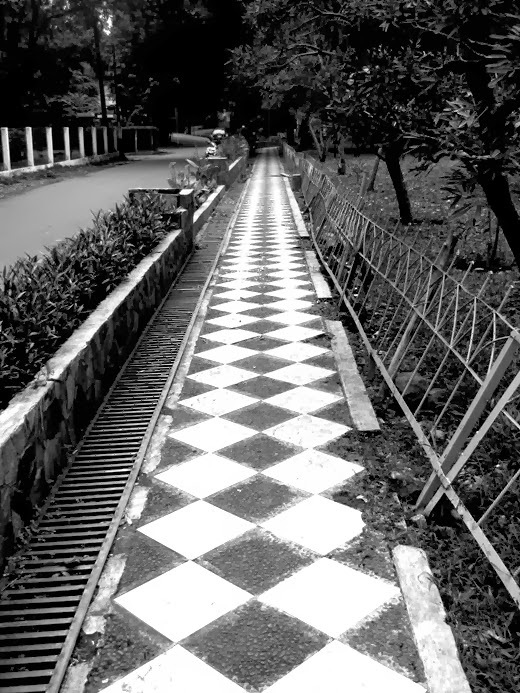 The fence on one side of the Kencana Park (Bogor, West Java, Indonesia) need to be repaired. Lovely contast and nice pattern! Interesting pattern on the sidewalk which makes for visual interest. Hm ... like the pavement. Beautiful and interesting photo in b&w! efinitely a wonderful shot in B & W! A champagne toast and much happiness! Happy 2014! Leovi. Nice in black & white Lina. A lot of pattern sequences going on here. Wonderful lines and patterns in this B&W shot! Cool sidewalk! Chess is very popular here in Norway after Karlsen became the world master. This reminds me of chess... And a great photo! Beautiful photo in B&W! Interesting pattern and nice contrast! the broken fence adds interest to the image. :) Who did it?